Goodness, it's been a long time since I've visited my blog. Chalk it up to the project that ate my brain at work, lots of visiting family, and the demands of my garden. At this rate I hardly dare show my face tomorrow at our SAGBUTT gathering (Kruckeberg Botanic Garden; check our Facebook group for details). Last year I wanted to see if I could harvest fresh vegetables 12 months a year and I surprised even myself by doing so, easily. I continued to harvest carrots planted last year right up until May, when some carrots that were part of a salad mixture sown in the greenhouse this winter, were ready to pull. I ran out of leeks and turnips and parsnips by the end of March but I'm sure if I had planned better I'd have been able to harvest them for a couple more months. I'm still cutting kale from that same winter sowing. The other salad greens are just a memory. 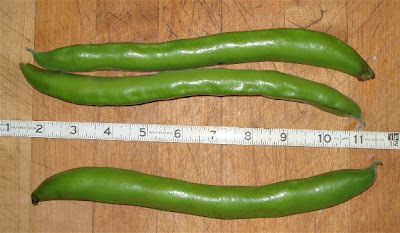 The fava beans are a new variety (for me), Imperial Green Longpod. They weren't kidding about the long part. I planted my favas last November, covering them with a lightweight row cover so they wouldn't get washed out by rain or eaten by mice. I really think I need to start planting more things in the fall and early winter. Parsnips planted in early spring are a disaster for me. The one year I planted them in January I had a great crop. I'm going to try to keep a tally of my harvest this year just to get an idea of the economic value of my "puttering in the garden" as the undergardener puts it. I've arbitrarily declared the gardening year to begin in June. 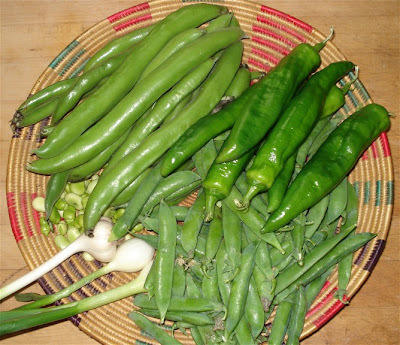 So far this gardening year I've harvested 4# shelling peas, 4# fava beans, 6 anaheim chilis, a couple of green bell peppers, 12 carrots, 10 heads of garlic, 3# of kale, sorrel, and basil. Ready in a week or two: Cucino cucumbers, and Parthenon zucchini.